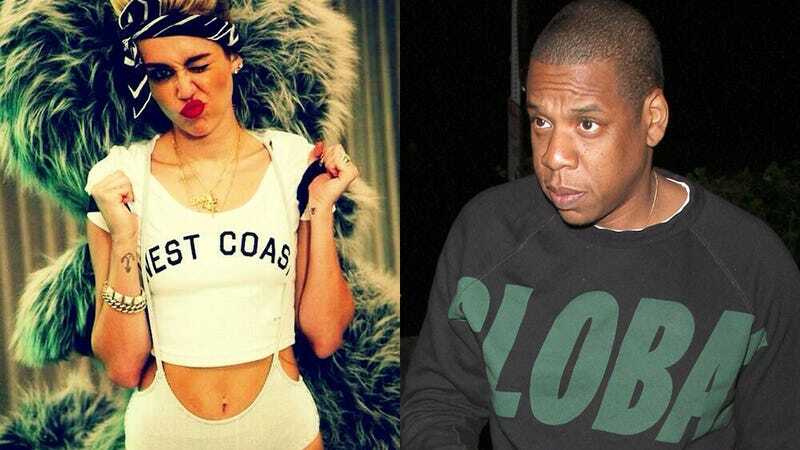 During a charmingly goofy Twitter Q&A in which the world learned that Jay-Z had a childhood love affair with Captain Crunch with Crunch Berries, Hova was asked about some lyrics from his song "Somewhere In America" off Magna Carta Holy Grail: "Feds still lurking, They see I'm still putting work in/Cause somewhere in America, Miley Cyrus is still twerkin', ha!" "Do you really think Miley is still twerking somewhere in America?" asked one user. "yes! she is an old worlds worst nightmare," replied Jay-Z, and added "Black neighbor, and the daughter not seeing color." Lede images via Twitter and Pacific Coast News.